EXPANDED MEDIA: Ann Hamilton Reflection prints part of Typology- Morphology -- Work from the institute for Electronic Arts, on view now at SOAD's Fosdick Nelson Gallery, September 4th - October 9th.Students admiring Ann Hamilton's prints at the opening of: Typology- Morphology -- Work from the institute for Electronic Arts, this past Friday evening. Ann produced this series of prints titled: Reflection, A suite of 12 Iris prints on Arches watercolor paper. Ann has been to the IEA numerous times since it was founded in 1997 and has produced several very large print series. Ann Hamilton Reflection prints part of Typology- Morphology -- Work from the institute for Electronic Arts, on view now at SOAD's Fosdick Nelson Gallery, September 4th - October 9th.Students admiring Ann Hamilton's prints at the opening of: Typology- Morphology -- Work from the institute for Electronic Arts, this past Friday evening. Ann produced this series of prints titled: Reflection, A suite of 12 Iris prints on Arches watercolor paper. Ann has been to the IEA numerous times since it was founded in 1997 and has produced several very large print series. 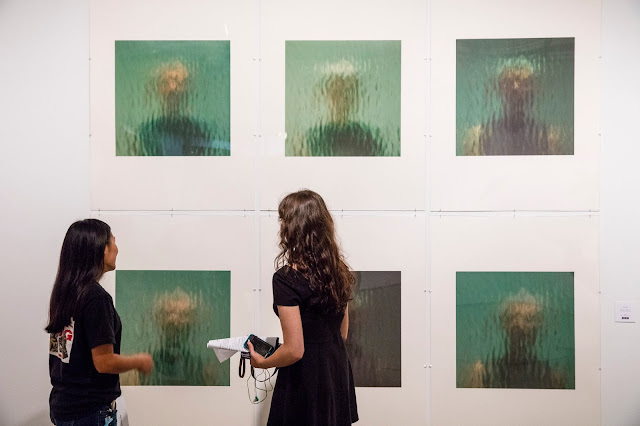 Students admiring Ann Hamilton's prints at the opening of: Typology- Morphology -- Work from the institute for Electronic Arts, this past Friday evening. Ann produced this series of prints titled: Reflection, A suite of 12 Iris prints on Arches watercolor paper. Ann has been to the IEA numerous times since it was founded in 1997 and has produced several very large print series. President Barack Obama will award the National Medal of Arts next week to Ann Hamilton, a visual artist and a professor of art at Ohio State University. Ann Hamilton was one of the earliest artists to work at the IEA. Over the years she has returned many times producing a monumental body of printed works. She often works in large series, from which a selection of images are then used to produce individual editions. A recent example of this working practice is the Phora series, which includes a set of twelve prints that were editioned and two copies of the complete series of one-hundred-ninety-two prints. The Reflection Series was the third group of prints made by Hamilton at the IEA. These images mark the occasion Hamilton’s installation myein at The United States Pavilion 48th Venice Biennale 1999. The images are reflections of the artist on multiple layers of glass that were stacked in preparation for the construction of a gridded wall that would cross the entire facade of the United States Pavilion in Venice. Photographed at five minute intervals, the series documents the shifting weather as seen through the recently uncovered pavilion skylights. Among her many honors, Hamilton has been the recipient of the Heinz Award, MacArthur Fellowship, United States Artists Fellowship, NEA Visual Arts Fellowship, Louis Comfort Tiffany Foundation Award, Skowhegan Medal for Sculpture, and the Guggenheim Memorial Fellowship. She represented the United States in the 1991 Sao Paulo Bienal, the 1999 Venice Biennale, and has exhibited extensively around the world. Her major commissions include projects for the Park Avenue Armory, The Guggenheim Museum, New York, Contemporary Art Museum, Kumamoto, Japan, La Maison Rouge Fondation de Antoine Galbert, Paris, France, The Musee d’art Contemporain, Lyon, France, The Stedelijk Van Abbemuseum, Eindhoven, The Netherlands, The Museum of Modern Art, Tate Gallery, Liverpool, Dia Center for the Arts, New York, and The Museum of Contemporary Art, Los Angeles.